Tottenham are lining up a summer swoop for Aston Villa striker Christian Benteke, 22. Christian Benteke: On Tottenham's wishlist? Former Tottenham and Wigan defender Pascal Chimbonda, 33, is on trial with MLS club Chicago Fire, with a view to a permanent deal. Arsenal boss Arsene Wenger will splash out £70m in the summer to strengthen his squad. Athletic Bilbao defender Fernando Amorebieta, 27, is a target for Arsenal. Barcelona right-back Dani Alves, 29, has urged his club to sign England midfielder Jack Wilshere, 21, from Arsenal. Liverpool goalkeeper Pepe Reina, 30, has again ruled out a summer move to Barcelona but hopes Tottenham midfielder Gareth Bale, 23, leaves the Premier League to join Real Madrid. Manchester City have made the first move to sign Brazilian striker Neymar, 21, from Santos. Former England coach Fabio Capello says Mario Balotelli has "surprised" him since his move to AC Milan. Capello, who is now in charge of the Russian national team, praised the striker's commitment and team spirit, adding: "I never saw him like this at City or at Inter." Atletico Madrid may attempt to sign Bayern Munich's Mario Gomez, 27, to replace Colombian striker Radamel Falcao, 27, who is being targeted by several top European clubs, including Manchester City and Chelsea. Bayern president Uli Hoeness has said he does not expect coach Jupp Heynckes to move to Schalke after he leaves Munich, where he will be replaced by Pep Guardiola, at the end of the season. "This is probably an April Fool's joke," Hoeness said of the rumours first circulated by Bild newspaper. Arsenal midfielder Santiago Cazorla, 28, says the Gunners' Champions League opponents Bayern Munich are the favourites to win the tournament, along with Barcelona. Italian side Roma are ready to offer Manchester City boss Roberto Mancini a £4.5m-a-year contract to be their new manager. Brendan Rodgers says defender Jamie Carragher, 35, will be offered a position at Liverpool when he retires from playing at the end of this season. Paolo Di Canio's decision to resign as Swindon manager has paved the way for him to return to former club West Ham. Paolo Di Canio: Could he be joining West Ham? BT target Manchester United defender Rio Ferdinand, 34, to become their leading football analyst next season as they kick-off their coverage of the Premier League. Chelsea captain John Terry, 32, believes supporters have a right to criticise interim manager Rafa Benitez if the results remain poor. Terry also wants Chelsea to offer midfielder Frank Lampard, 34, a new contract. Chelsea are ready to offer Lampard a new deal - they are expected to sit down with the player and his representatives over the "next week or so" to extend his career at Stamford Bridge. Midfielder David Bentley says he can win over the Blackburn Rovers fans after he rejoined the club on loan from Tottenham last week. The 28-year-old forced a move from Rovers in 2008. Former England boss Steve McClaren is fighting for his job as FC Twente manager - with the club's fans demanding he gets the sack. Oldham's late equaliser against Everton in their FA Cup fifth round tie will reportedly earn them around £500,000. 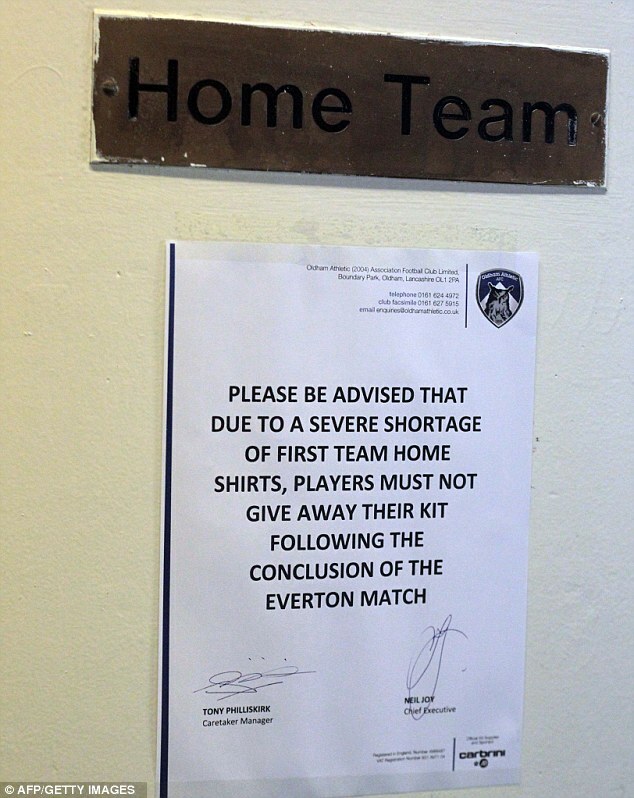 With these extra funds coming into the club, maybe Oldham's players will be able to give their shirts to the fans following the final whistle in the replay at Goodison Park.